Android App (Client 4.3.1.19), logged in as Parent Mode on Samsung S7. (SM-G930V Android v7.0). When I go to the Activity/Messages to view the messages, I am unable to 'Block this Number'. It gives the error "Failed to update rules. Please try again later". I have been able to do and use this feature in the past. (screenshot included). Also, I am not getting any results displaying in the Activity/Search Terms (screenshot included). I confirmed and even tested via my child's Android phone where Chrome browser was being used. I also do not see any Search Term results when logged into the Norton Family Web Portal. We have now disabled the Chrome app on child's phone until we have a solution. 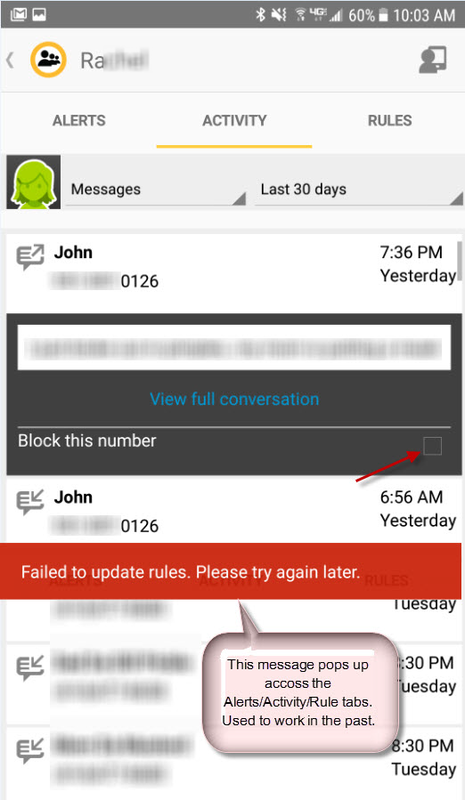 Re: Block this Number gives error "Failed to update rules. Please try again later". 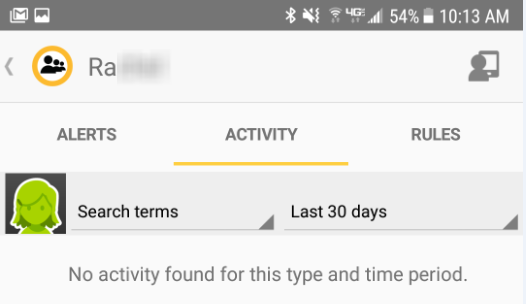 Search Terms returning "No Activity Found for this type and time period". Please note that Norton Family tracks your child’s search activities through the Norton browser, not Chrome. 1. Can you please let us know what device(s) the monitored child uses, a PC in additional to the android device you mentioned? Also, please let us know the Norton Family version on the child's device. If a Windows PC, you can find version by clicking the Norton Family icon in the system tray and selecting “About Norton Family”. If it's an Android device, you already know as you indicated the version # for you, the parent's android device. 2. Can you please send me your Norton Family account email address by private message via the forum by clicking Inbox at upper right hand corner?